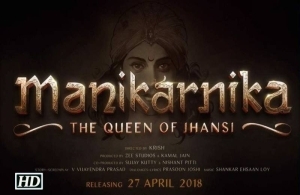 MANIKARNIKA – THE QUEEN OF JHANSI is the story of the brave Rani Laxmibai. Manikarnika (Kangana Ranaut) lives in Bithoor and is a favourite of the Peshwa (Suresh Oberoi) and he has brought her up with lot of love. One day Dixit Ji of Jhansi (Kulbhushan Kharbanda) spots her facing a ferocious tiger fearlessly. Impressed, he asks Peshwa for her hand in marriage with Jhansi’s king Gangadhar Rao (Jisshu Sengupta). Dixit Ji is aware that the British is eyeing Jhansi and wants to annexe the kingdom at any cost. He realises that her brave persona would play a crucial role in giving a tough fight to the British. The marriage takes place and the king gives her a new name – Laxmibai.